Rosie O'Donnell is calling this photo of her daughter Vivienne (draped in live ammunition) "art." We're no experts on art, although we would really like to see the 60's exhibit at the Whitney, but that's besides the point. What is our point again? 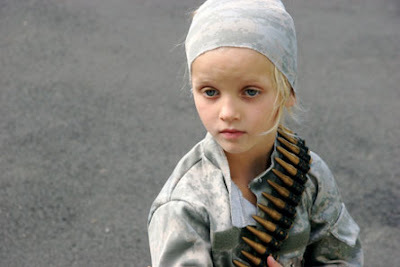 Oh...so Rosie posted this photo on her blog which we can only imagine is some sort of message about Iraq. We get it, Rosie. You're very, very, very opposed to the war and to President Bush. We're all in agreement on that, but inflicting irreparable damage on the psyche of your adorable daughter will not help anyone. Least of all, poor Vivi. We happen to think you may be heading dangerously close to a dark spot and should really talk to your therapist about your medication. When we say dark, we're referring to the crazy lesbian haircut (which you have admitted was a huge mistake and scared your children) and the waste of millions on that Broadway flop starring Boy George. We don't remember what it was called, but we do know it bombed. Sort of like Broadway's version of Gigli. Or Glitter. We definitely don't want to go there again. Please.